Projects, Reviews and Observations from the worlds of Wargaming, Table-top Roleplaying and other Classic Geek Pastimes. After going halves on an Imperial Knights: Renegade boxset with Dan from Forged at a Painting Desk, I found myself owning an Imperial Knight. The promise of a game in Nottingham gave me the deadline I needed to get the thing finished and painted. I was coming from a place of ignorance. Sure, I knew the basic background behind the Knight Houses – but I knew nothing about my Knight. I had no idea what House, or what purpose the Knight might fill, or how I would tie it in with my Space Wolves. I hadn’t anticipated touching the thing for a little while, hoping to let it gestate in the depths of my subconscious for a while. It was important that it fit with my Space Wolves aesthetically, but I wanted to do something other than just paint it Space Wolf Grey. I also remembered I’d seen that the Freeblade Transfer sheet had squid/kraken things on it and maybe I’d could use those. After all, Fenris is famous for something else other than the Wolves, Ice, and Space Marines - Kraken! I didn’t want a Freeblade, as I wanted the later possibility - should I ever somehow find the time - to field an entire force of Knights, resplendent in their house colours. Disaster struck when I attempted to order that transfer sheet though – it had long since sold out. 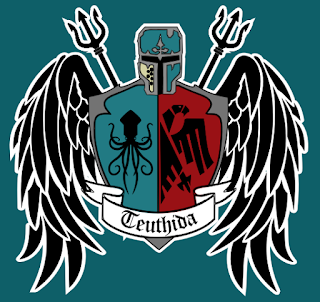 Further, reading through the Imperial Knight codex, I realised I would need a House Coat of Arms. I was up for the challenge of making my own (I’m by no means an artist!). I’d read on From The Warp about custom decals and it didn’t seem too difficult. 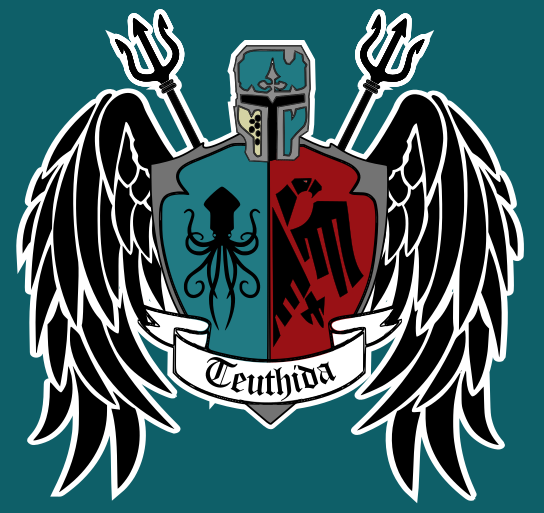 Following a quick search for free-to-use images, and time in Inkscape to make up my heraldry, it was done. I wanted to do something more than just abstract shapes (already prominent in my Space Wolves force) for the personal heraldry of the Knight. To complement the Nordic theme Space Wolves use, I used a Celtic knot, with an idea of using a different knot design for each Knight. One last touch was to put a wolf’s head on the pennant, to symbolise the co-operation between this Knight and my Chapter of choice. Things didn’t go quite to plan! I found that Dullcoat wasn’t good enough for sealing the ink onto the paper and the transfers were not only terribly flimsy, but the ink ran too. I was running out of time by this point, but thankfully the father-in-law-to-be offered a can of Halfords car lacquer. I wasn’t entirely convinced, but I was desperate. Turns out, it was perfect. With the magic bottles that are Micro-Set and Micro-Sol (and a little matte varnish to dull the gloss after) I’d finally got the Knight looking how I wanted. I couldn’t bring myself to rust it. The copper trim was a perfect complement to the sea-green already. So, it’s the only Imperial model I own that hasn’t been weathered. I still can't decide on a name for him, but given how many times he came back 'from the dead' in his debut, I'm thinking 'Undying' or something similar will be part of it! I think I could have done a better job breaking up the metalwork, but seeing as I'm the one who will see this side most games, I can live with it! I’m looking forward to taking it to battle again – particularly against the daemon possessed Knight Dan has been working on for a while now!